Rainer Zietlow spent more than half of his life with cars. Just after receiving his driving license, he crossed the Algerian Sahara together with friends for two times. During his studies he went around the globe on behalf of his university city in 1996/1997. At that point he noticed, that this should be his occupation for the next decades. Until today, he has toured 110 countries by car. However, the home of Rainer Zietlow, born 1969, is and will be Mannheim in Southern Germany, where he lives together with his wife and his son. In 2004 Rainer Zietlow founded his agency CHALLENGE4 GmbH and turned his hobby into a career. 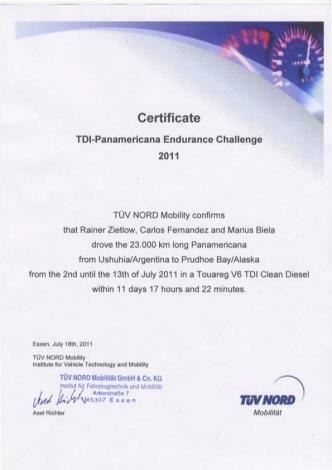 CHALLENGE4 is a specialist in planning and executing worldwide automotive projects with Volkswagen cars. Since then he completed all twelve projects successfully. His automotive success includes three "Guinness World Records" - all of them have been achieved in a team. 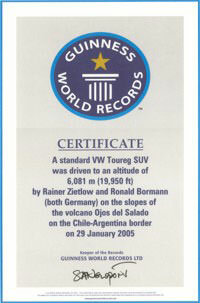 In 2005 he established a new altitude record for series-production vehicles with a Volkswagen Touareg V6 in Chile together with Ronald Bormann and a six-member team. 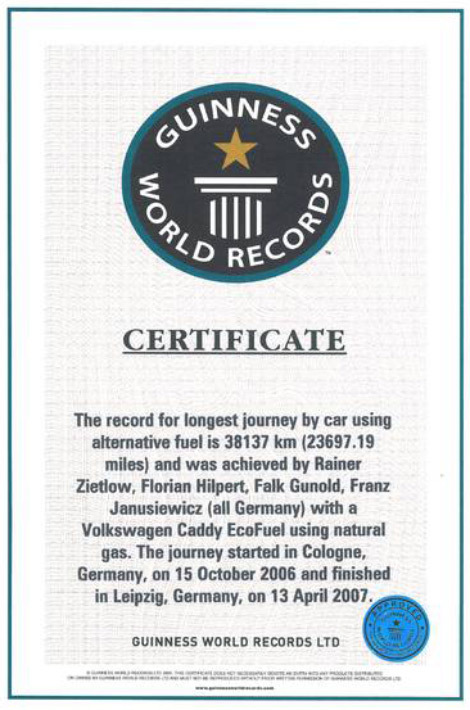 Afterwards he completed the first natural gas driven circumnavigation of the world in a Volkswagen Caddy EcoFuel with a four-member team in 2006/2007. 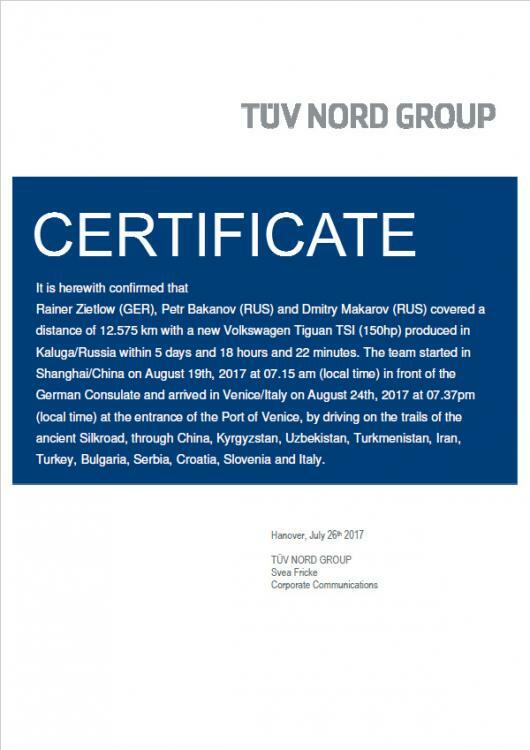 In 2013 he achieved the record with his eight-member team for driving the longest distance inside one country (Russia) with several Volkswagen Amarok. 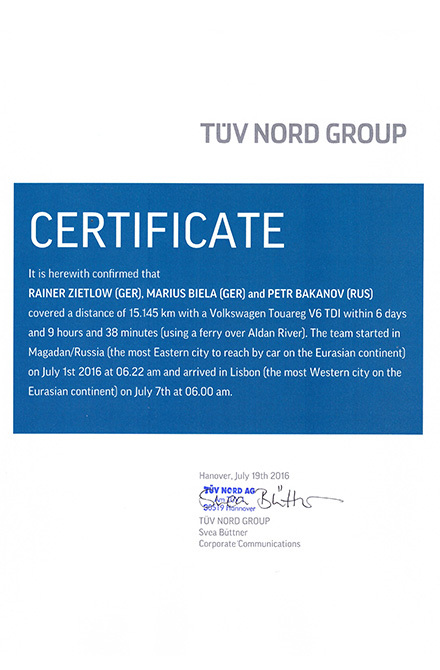 In between Rainer Zietlow set two long-distance-world records by completing the famous road "Panamericana" from Tierra Del Fuego to Alaska in 2011 and by driving one year later in the shortest possible time from Melbourne (Australia) to St. Petersburg (Russia). 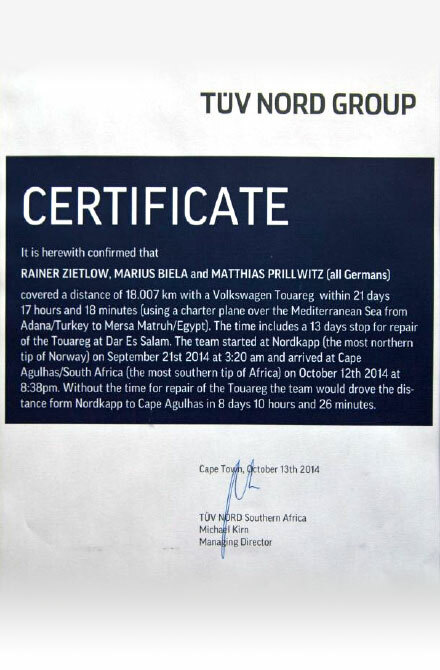 In 2014 Rainer Zietlow an his team dealt with the 18000 km long distance between the Nordkapp and Cape Agulhas (South Africa). Due to an accident which forced the team to stay in Ethopia for 13 days, they needed 21 days. 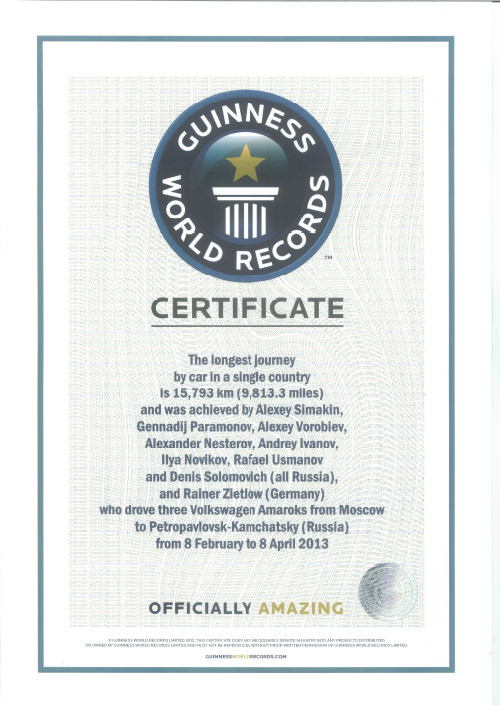 This was a new record for this stretch, but not the goal of Rainer Zietlow, who wanted to complete the tour in 10 days. 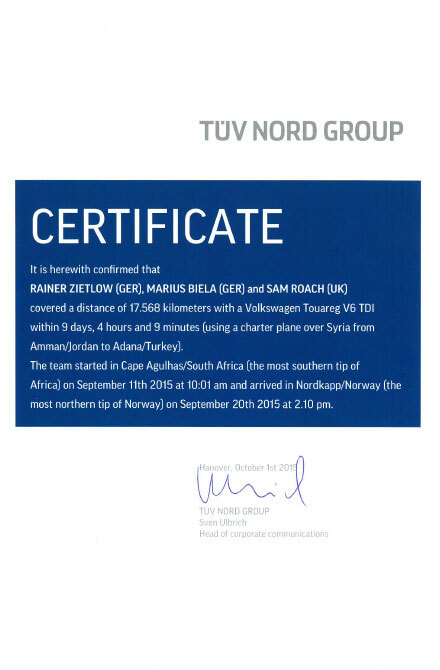 One year later he tried it again, starting in South Africa, and reached the Nordkapp 9 days and 4 hours later. 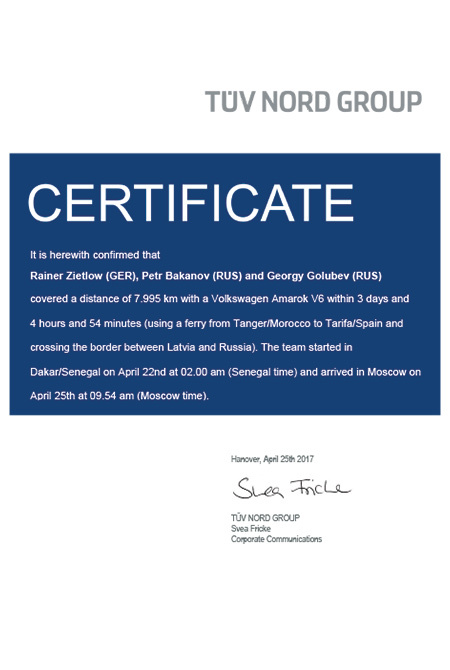 In 2016 Rainer Zietlow and his two teammates set a new record from east to west across the eurasian continent – from Magadan (Russia) to Lisboa (Portugal). Since 2005 Rainer Zietlow supports at almost every project the SOS-Children Village organization and visits at least one SOS-Children village personally to hand over the donation.